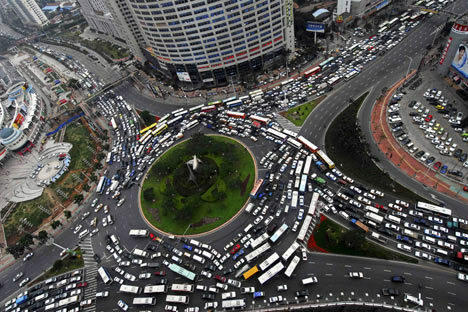 - Here's a picture of a traffic jam in southern China (original article here). - This rant demonstrates that the rush to reduce inequality (read: promote equality of result rather than equality of opportunity) inevitably results in a growth in the size of government in the short term and a sense of complacency in the long term, both of which are not good things. Here's another sober look, with discussions of how that goal is linked to America's public education system here and social safety net spending here. - Feeling all kinds of doom and gloom these days? This look backwards shows that things are actually going pretty well in a number of important respects, at least as compared with the 1970s (and it's no wonder, given how disastrous that decade was from a public policy point of view). - The spectre of Ariel Sharon will loom large over Israeli politics for quite some time, as this article points out. - Have a look at this difficult description of ethno-cultural trends in America's big cities. After reading it, I'm not sure if "E pluribus unum" is more than a mere slogan.